This first aid kit includes prepackaged unitized boxes of first aid supplies and a closeable three-shelf storage case made of steel for strength, and is suitable for use in offices, buildings, and other facilities with 75 or more occupants. The storage case has three shelves to hold supplies, a latch to keep the case closed, a handle to facilitate transportation to the site of an injury, and mounts slots for mounting the case on a wall or other flat vertical surface. 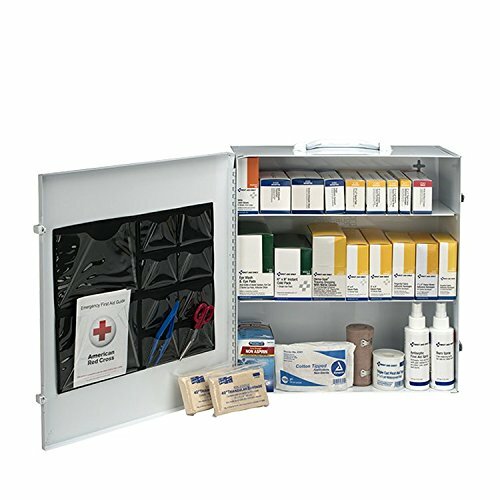 100 Person 3-Shelf Industrial First Aid Station in a Steel Cabinet. OSHA compliant box has easy carry handle or is wall mountable. Contents meet or exceed those required items from ANSI Z308.1-2009. The case measures 17.5 x 13.5 x 6 inches (H x W x D). (H is height, the vertical distance from lowest to highest point; W is width, the horizontal distance from left to right; D is depth, the horizontal distance from front to back.) Hardware and tools for mounting are sold separately. This first aid kit is manufactured to comply with American National Standard Institute (ANSI) Z308.1-2009 requirements for workplace first aid kits and supplies, which can help organizations to comply with Occupational Safety and Health Administration (OSHA) regulations and guidelines. Refill supplies are sold separately. If you have any questions about this product by Pac-Kit, contact us by completing and submitting the form below. If you are looking for a specif part number, please include it with your message.